"Look, we know you're new to this command, but the army field manual is very clear on the subject of squad stereotype composition. Every squad must include: 1 quiet religious guy who goes insane, 1 maverick loose cannon who plays by his own rules and dies in a blaze of glory, 1 covert recon operative with a dark past who at first betrays the team but then has a last minute crisis of conscience and nobly sacrifices himself for the greater good, 1 fresh faced new recruit who survives but loses his innocence and learns to become a man and 3 or 4 other guys who you don't care about so they can get brutally shot so you can show how serious the war is." —Loading Ready Run makes it official. Military and war stories have a number of different levels of focus, from the global strategic level all the way down to squad tactics, and even the plights of individual soldiers on the battleground. When the focus is at the smaller end of the scale, we get this trope. Very often, this is a squad composed (like a Five-Man Band or The Team) of interlocking character types or roles. There are quite a few similarities with the types and roles of the Command Roster. The main difference is the Command Roster is a very specific combination of skills that may not be strictly military. The Squad may be a Badass Crew and have a Squad Nickname. If it's made up of women, it's an example of an Amazon Brigade. The trope's inspiration comes from the fireteam and squad units of infantrymen. Such a setup possibly first appeared in The Napoleonic Wars, where open order skirmishers armed with rifles (at the time, more accurate but slower to reload than standard muskets) depended on close coordination to be effective. They would stealthily get into a good position to fire good shots and avoid the sweeping, densely-formed gunfire that enemy line infantry units provided. The use of fire and movement tactics - some soldiers move towards the enemy, others provide covering fire - also contributed to the reorganisation of militaries into small squads. However, gunpowder in The Napoleonic Wars was "black powder" that would quickly fill a battlefield with thick smoke, which made firing accurately difficult. It was not until World War 1, where breech-loading rifles using smokeless powder had become commonplace, that the average infantryman became far more accurate and quick-firing. Throwing in the proliferation of machine gun crews that would inevitably shoot first when a mass of men approached them, defenders in cover were granted a huge advantage. Military science thus experimented: infantrymen would attack fortified positions in small groups, approaching with methodical covertness. This became the default method of military tactics, and remains so to this day. The Leader, who might be of several different types. If the leader is an Officer and a Gentleman, expect a Captain Smooth and Sergeant Rough relation with a Sergeant Rock. If the story follows the characters through boot camp, or specialized training, expect to see Drill Sergeant Nasty make an appearance. If the story follows them after the war, expect at least one Shell-Shocked Veteran. J Squad in Edge of Tomorrow. Evangelion 303: features the "Evangelion squad". General Chaos, which makes players choose between four different squad types. The Gold Eagle Books action-adventure series of the 1980s — SOBS (Soldiers of Barrabas, a mercenary unit secretly employed by the US Government), and the anti-terrorist groups Phoenix Force and Able Team. Some Halo games, namely Halo 3: ODST, Halo: Reach, and Halo 5: Guardians, as well as Halo 4's Spartan Ops co-op campaign. Mass Effect, Mass Effect 2, and Mass Effect 3 all play the trope fairly straight with a few character-based subversions. Medal of Honor: Pacific Assault gives us a main character with a voice and a personality, as well as a distinctive squad to support him. 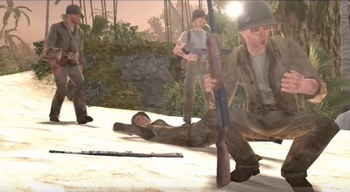 Just like in 'Medal of Honor: Pacific Assault', Medal of Honor: Vanguard also features a squad, however the main character is silent during gameplay. Team Fortress 2 has a squad consisting of deranged mercenaries and parodies of the above tropes. Thirty Seconds Over Tokyo, about the 1942 Doolittle Raid against Japan, focuses on the five-man crew of a single B-25 bomber. A five-man B-52 bomber crew. Lt. Lawson's the leader, the co-pilot likes to play poker, the bombardier is a home movie enthusiast, and Cpl. Thatcher is a hick from Montana who proves unexpectedly tough under pressure. Tomahawk: Tomahawk commanded a squad of guerrilla soldiers known as Tomahawk's Rangers. ''The Zone'' novels by James Rouch.